Newark, NJ - Pro-Palestinian activists interrupted the “hometown kickoff” for the presidential campaign of Sen. Cory Booker. The pro-Palestinian protesters picked up on the theme, shouting “Justice for Palestine,” according to reports. They waved Palestinian flags and keffiyahs, a traditional Arab headdress. “You say ‘Justice For All’ and he named, you know, clean water, housing, affordable health care, freedom but he doesn’t … talk about Palestine. They’re struggling just as much as us here — even more,” Wajeeh Abushawish, who was part of the group, told Yahoo News. The protesters were part of the Students for Justice for Palestine chapter at Rutgers Newark campus. 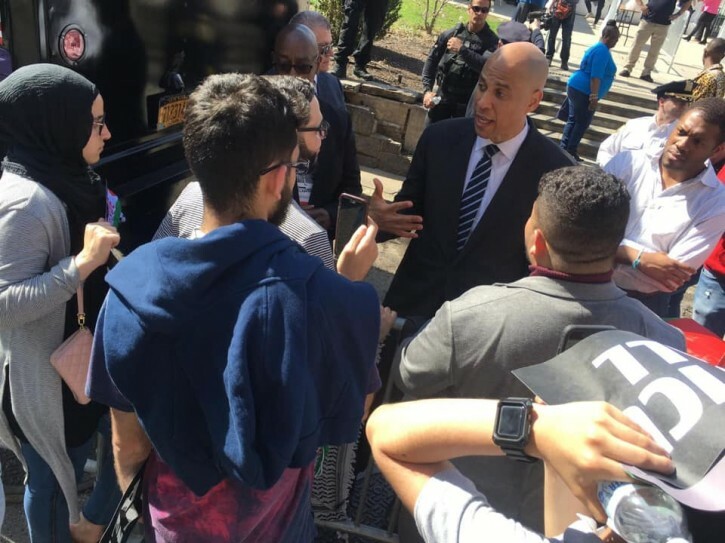 Booker met with some of the protesters after the event. Booker is a co-sponsor of a Senate bill that would penalize businesses that comply with Israel boycotts. He announced his presidential bid in late January. Yup, you are correct, it is all their fault, there were no anti Israel, pro-palestinian protesters until those three came along. Where does VIN find you people? Islam is not logical. read the koran; I did. It is an eye opener as to how Islam uses lies to advance their causes. “ Yup, you are correct, it is all their fault, there were no anti Israel, pro-palestinian protesters until those three came along. All leftist democrats supporters supported by the democrat party and you. He is running for president of America not Palestine. Why don't they protest the Palestinian president for not doing more.